Weekend vote: How many fine tuners do you have on your fiddle? "Why do you have one fine tuner, and I have four?" This is one of the first questions many of my youngest students ask me, as they compare their small fiddles to my full-size. One reason is that a little goes a long way, when it comes to tuning small violins: turn a peg a fraction of the millimeter, and suddenly the pitch has changed from something around an "A" to a "C sharp"! So one needs to be able to tune in fine gradations, on a small fiddle. An "E" string, being strung so tight, has the same issues as the strings of a small fiddle, so it benefits from always having a fine tuner. Another reason is that it's just easier to tune with fine tuners, and also to get the pitch very precisely where you want it to be, rather than "settling" for the pitch being a few cents off. When I was a child, I had the impression that fine tuners were for kids and beginners, and pegs were for grownups and mature violinists. That's why I had four tuners and the grownups had only one. This was why, as a young adult, I had to continue to wrestle with some of the most ill-fitting, bad-behaving pegs that ever were! A few things have changed my view on pegs and fine tuners. One was when a respected colleague told me that she simply always makes her students get fine tuners on all their strings on their full-size instruments, especially when they've grown into a full-size at a young age. Another fact that changed my perspective was when Elizabeth Pitcairn had Wittner Fine-Tune pegs installed on her famous "Red Stradivarius." You mean, fighting with pegs is not a necessary part of being a "grown-up" violinist? 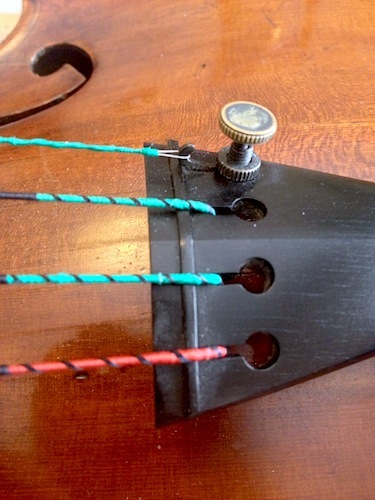 Fortunately, my current violin's pegs fit quite well, so it works for me just to have one fine-tuner. But I'm much, much more likely these days to recommend that students and colleagues get either four fine-tuners or fine-tune pegs. It's better to have your violin perfectly in tune, and more likely to happen if you make it easy on yourself! I was very happy to dispense with my fine tuners...I felt like I reached a milestone at that point. I don' t nessecarily want "easier". And tuning without them isn't harder if the pegs fit well. However I can't speak to tuning issues in climates other than my own...perhaps they would the better option in that case. One fine tuner here -- E.
I started on a 1/2-size fiddle, then went to 3/4 a few years later. The only strings I had fine tuners on then were E-A. Didn't go up to 4/4 till first year of high school. Switched to wound-gut A-D-G about a year later and removed the A fine tuner. I play on three fiddles -- about the same amount of time per day on each one. Starting each practice session with the A-440 tuning fork or electronic tone and re-checking several times during a session -- being really strict and picky about tuning -- keeps paying off. There's a good deal of humidity here at least half the year; but my instruments stay well tuned -- even the two that have wound-gut A-D-G -- possibly, in part, because I keep them played in each day. Many times, I don't have to adjust tuning when starting practice or during it. Other times, I barely have to make any change. I was taught / told that fine tuners are for steel strings and not to be used with gut strings. Several years ago I had a wittner tailpiece installed on each of my instruments because of shoulder problems. Now I CAN tune, which seems rather basic. I can't try gut strings, and probably both instruments would sound differently with a different set-up, but they sound fine as they are, and I can play them. Sometimes we encounter unexpected lemonade in life, and just cope. here in Japan it is quite common to see two adjusters. This is copied from Oistrakh. however, Oistrakh used a steel a. The players I know (some of them top pros ) who use the adjuster use regular a strings of one sort or another. they say it is not a problem. I have no idea if this is true or not. I need an option that says "Fine Tuners are built into my Tailpiece". I think that the only problem with fine tuners is that they add weight to the tailpiece which can dampen the sound. If you want more than one or two fine tuners, opt for a tailpiece with the tuners built in because they're lighter. There seem to be plenty of pro fiddlers that use these. I imagine, no matter how good you and your fiddle are, travelling from place to place is going to make the pegs shrink and swell, and changing tuning on stage needs to be quick. Perhaps those who frown heavily on fine tuners always play in the same room and don't change tunings often or at all, but i think it boils down to personal preference not status. After suffering too many climate changes during travel, and struggling with the pegs either getting loose or stuck, I just went for it and got a tailpiece with built-in tuners. Now that I am getting arthritis in my left hand, they are a godsend. I have one fine-tuner, and gear pegs. I love it. If I did not have gear pegs I would have a Wittner composite tailpiece with the four tuners built-in. Every student violin setup under, say, $1500 should include the Wittner tailpiece, and everything over that should include Knilling pegs. A compromise between the purist "E string only" and the Wittner would be a tailpiece with just the E and A string tuners built in. I don't know about the steel A strings that Buri mentioned, but what I see is that students (i.e., teenagers) who can tune their own D and G strings just fine still have a devil of a time pushing back on the A string peg, it's just so awkward. Maybe Wittner should make such a tailpiece and have it endorsed by Anne-Sophie Mutter, who also has E and A fine tuners on her Strad. I use to have two, but my E string fine tuner broke, so I switched the A string one over. Never looked back. I like having 4 fine-tuners on my viola because I live in a place whose climate lends itself to sticky or slippery pegs. I live in a tropical climate so I use not only four inbuilt tuners (Wittner tailpiece) but I also have the Wittner geared pegs...double insurance ! I could probably dispense with the fine tuners now but they are still useful for fine adjustments. I damaged the first finger on my left hand many years ago when struggling with the wooden (friction) pegs. The finger still gives me trouble after many years so I want nothing to do with wooden pegs anymore and I do not care whether they are fitted properly or not. I just think they belong in the past now that there are alternatives available. I have one on my violin and had none on my viola. My viola is rather large for me, so tuning with the pegs has always been a strain. I finally got a new tail-piece with built-in tuners for the viola and it's so nice now. None on either of my fiddles. I have Knilling Planetary pegs on both. I will never go back to friction pegs. I also look forward to the day when all student fractional instruments come with them. The time it would save in class tuning instruments would be worth every penny spent (my opinion). For those purists and naturalists who insist on wooden pegs yet tolerate the ugly looking chrome fine tuners, the planetary pegs look as natural as can be and eliminate the ugly tuners (which are not natural looking at all). Putting chrome fine tuners on any beautiful violin is like putting braces on a gorgeous swimsuit model. These are all just my opinions and I don't endorse any particular brand although the only one I have experience with is Knilling. I believe Elizabeth Pitcairn has Wittener planetary pegs on her 1720 Strad. I have one violin with Knillings and one with PegHeds. The PegHeds seem to be just a hair smoother to operate, but the Knillings work fine. Potter's put in the PegHeds for me and did a fine job. Dan Foster put in the Knillings for me, and even though they were his first set of gear pegs to put in, they look great and work fine. Both of my violins have Wittner composite tailpieces with built-in fine tuners. I am very happy with them. I don't ever want to "grow up" and tune with pegs. My daughter grew into a full size violin at a pretty young age and she has 4 fine tuners. My viola also has 4 fine tuners, and I like them. My violin has the standard fine tuner on the E and no others, but the pegs are pretty good on it, easy to turn, don't slip, etc., so I haven't found it worth changing.